Companies creating a new position called, “Social Media/Marketing Manager”. Recruiting new talent via social media like LinkedIn, etc. And that really just scratches the surface! Consider all the new buzz words that have emerged in just the last couple years; Reputation Management, Social Media Marketing, SEO, SEM, Pay-per-click, etc. Most of these are already being over used, misused and/or bundled with a larger topic. Granted, this course focuses mainly on analytics and data mining but the implications are huge. Today’s pilot course can quickly become tomorrows field of study and marketing degree. If the last two decades have done nothing else, they have shown that it pays to not underestimate Economic Evolution. 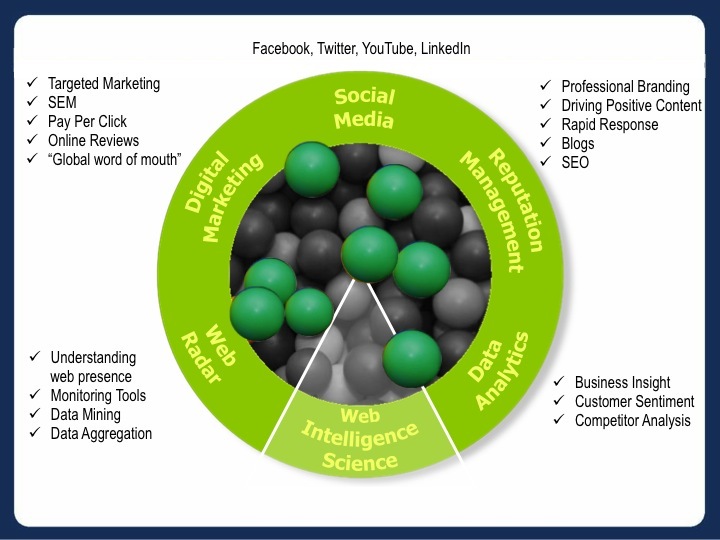 Here is a simple illustration of what this Web Intelligence Science may look like and what the future is bringing. Click on the link above to download the animated slide.